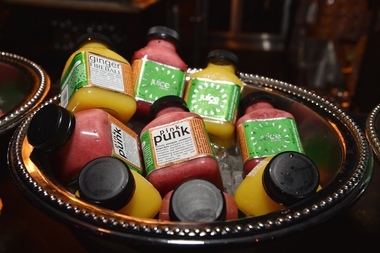 A collection of Juice Press products at a 2014 event "presented by Juice Press" celebrating reality TV stars Kendall and Kylie Jenner. The juice bar is opening a location in Park Slope in 2016 on Seventh Avenue and Third Street. Juice Press sells organic cold-pressed juices, smoothies, and juice cleanses. PARK SLOPE — An organic juice bar that sells a $15 "superfood bath" smoothie is set to open this spring at 207 Seventh Ave.
Juice Press will move into the space last occupied by Yogurtland on Seventh Avenue and Third Street. The NYC-based juice maker was founded in 2010 and now has 32 stores, a spokeswoman said. Juice Press sells organic cold-pressed juices, cleanses and smoothies that are touted as a favored form of liquid nutrition for supermodels and other professional beauties. Some of the juices cost upwards of $10 for a 16-ounce serving, but Juice Press says its prices represent the "fair market" cost of making juice out of raw, organic produce. The $15 Guru smoothie is a 510-calorie, 16-ounce "meal replacement" made of frozen fruit and "superfoods." It initially sold for $18, but Juice Press founder Marcus Antebi lowered the price in 2011. ► The women's boutique Flirt Brooklyn closed its North Slope location at 95 Fifth Ave. on Jan. 3 and moved to the South Slope at 586 Fifth Ave., between 16th Street and Prospect Avenue. Flirt has had the South Slope outpost since 2013. In addition to producing and selling clothes in the space, Flirt offers sewing classes there. Merchandise at the South Slope store is 20 percent off for the time being, the store announced on Facebook. ► A gym that lets you compare your performance to other exercisers is coming to 248 Flatbush Ave., between St. Marks Avenue and Prospect Place. Orangetheory Fitness gyms have screens that display the exertion levels of all exercisers. The chain is opening several locations in Brooklyn this year, according to the New York Times. The Flatbush Avenue outpost will open this summer, a spokeswoman told DNAinfo New York. ► Neighborhood pharmacy Palma Chemist closed Dec. 28 after 54 years in business at 159 Seventh Ave. and Garfield Place. The space will be renovated and the outdoor shop Gear to Go will move in this spring. ► French bakery and coffee shop Les Deux Amis opened in late December at 427B Seventh Ave. between 14th and 15th streets. ► The G&E 99 Cents Store at 542 Fifth Ave. between 14th and 15th streets, a go-to spot for parents looking for balloons and other party supplies, closed in December. Park Slope Parents founder Susan Fox called the closure "the end of an era" and said the store had been in business for about 25 years. Balloons from the shop were often used a decorations during the annual Park Slope Halloween Parade, Fox said. "It's really sad!" Fox said in an email.